The Lean Warehouse are happy to offer a choice of 2 delivery options for a wide range of our products. For some of our smaller products and orders we are able to send via Royal mail (£1.30 - £7.25), which provides a reliable, low-cost solution for delivering the products you can fit through the letterbox!. Please not that this is not a tracked service. Although we will be able to provide proof of postage we will be unable to provide any tracking or delivery details. Larger/Heavier products and orders will be dispatched by our next day courier (priced at £7.95), and are tracked and signed to ensure we can keep an eye on your parcel from door to door! Need a delivery for a certain time? Please get in touch so we can arrange a timed delivery for you at our competitive prices! NB: Only orders received before 12pm for stock items ONLY will be dispatched the same day. Some stock will take longer for us to dispatch.. Please see product description for details. We will ship these items on a next day service where applicable once the order is ready. We are able to ship our products all around the globe. 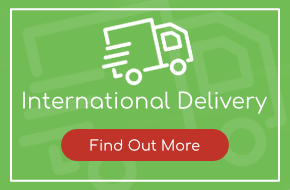 Our international delivery offers a high quality, fully trackable service to deliver your goods efficiently! Need it shipped internationally fast? Please get in touch with our team to discuss options. All goods must be checked on arrival, any issues regarding orders must be reported within 7 days of goods arrival. We reserve the right to dispute any claim outside of this time. Once we receive your item, we will inspect it and notify you that we have received your returned item. We will immediately notify you on the status of your refund after inspecting the item. If your return is approved, we will initiate a refund to your credit card (or original method of payment). You will receive the credit within 3-10 business days, depending on your card issuer's policies. You will be responsible for paying for your own shipping costs for returning your item. Shipping costs are non refundable.